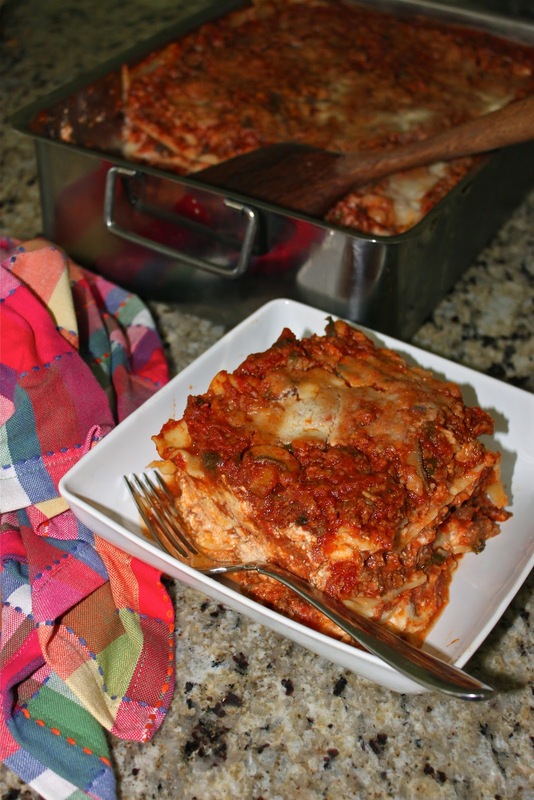 If there is one pasta dish that is truly a labor of love it has to be lasagna! The time and expense of making lasagna sadly prevents me from making this indulgence very often; my family is lucky if I make it once a year. But my husband insisted that I make my lasagna for a very dear friend today whose mother passed away. Despite the 90 degree temps outside, we heated up the oven and the kitchen to bake two big pans of lasagna. 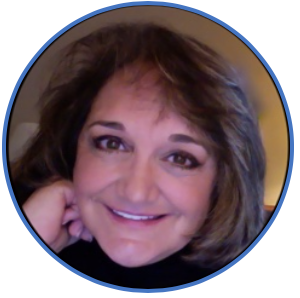 And as you know: special people deserve special things and our friend is certainly worth this extra effort during her time of loss. This recipe is very special to our family; so special in fact, that our oldest son loves it so much that he asked for the recipe to prepare for dinner on the evening that he proposed to his girlfriend (and she said ‘yes’!). Now that’s a compliment! I’ve also given this recipe to my daughter who shared it with all of her teaching friends in Tennessee. My youngest son in Chicago, an aspiring young cook, always “wow’s” his friends with this lasagna too. 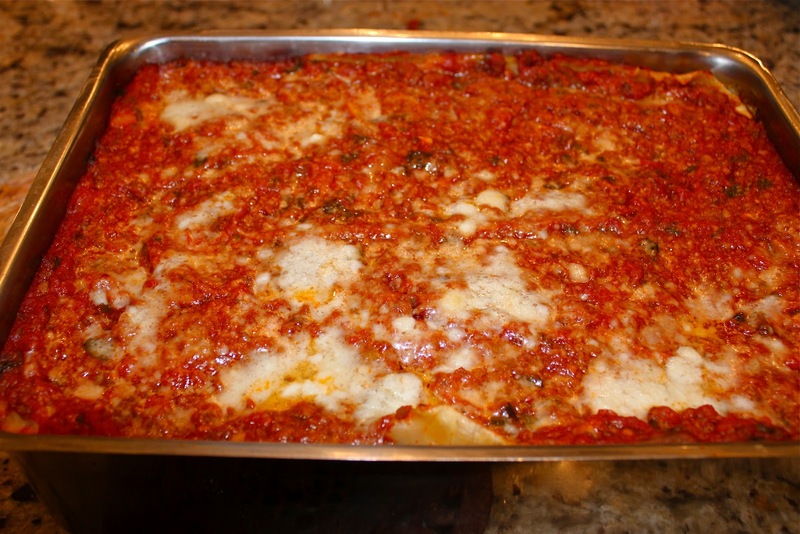 I’ve only used one lasagna recipe other than this one, which is a very traditional lasagna for the Italian Carnivale and that I shared in a post on February 22, 2011. Truthfullly, this recipe is even better than the decadent “La Grande Lasagna di Carnivale”. The Bolognese sauce for this lasagna is not my family recipe, but it is still wonderful. It has a little bit of sugar added that many Italian cooks often add to soften the tang of the tomatoes and which my family never added. Actually for this recipe, I think it is quite a nice addition. If you don’t like to add sugar to your tomato sauces, just omit it. 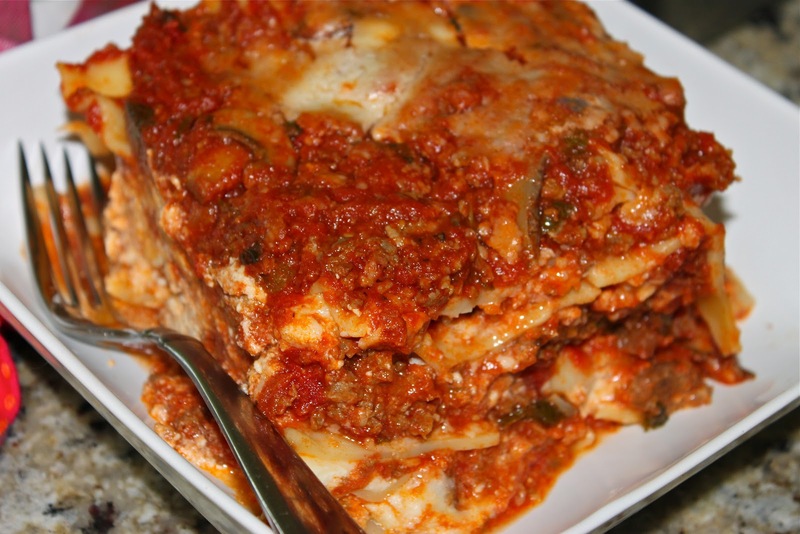 If you decide to go ahead and jump in and prepare this lasagna, give yourself quite a big portion of your day to make the Bolognese sauce OR make the sauce the day before. The sauce is the big time demand of this dish. I hope that you enjoy this wonderful lasagna. Please let me know if you prepare it and what you think! THIS IS MUCH BETTER the SECOND DAY when the flavors have had time to BLEND and MARRY OVER TIME and the lasagna stays MORE ‘IN PLACE’ IN A NICE STACK of pasta. 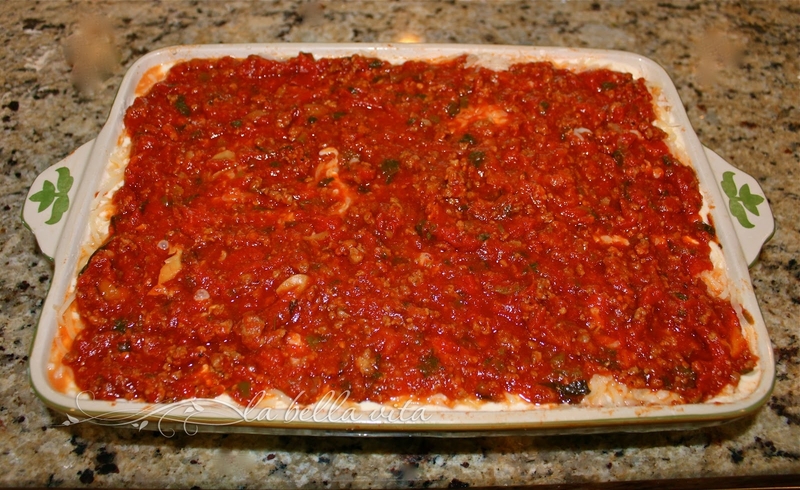 Lasagna after baking – This is a shorter 3 layer pan. A second pan of baked lasagna (this time it was covered with foil for the last 15 minutes). This is a HUGE 4-layer pan of lasagna, weighing in at 16 pounds! 7 cups Italian-style tomatoes AND the juice. Brown the onion and garlic lightly in olive oil in a large, deep pot. Add ground beef and Italian sausage and cook until browned, stirring and chopping the meat so that it is fine and not clumpy. Simmer on a low flame/burner, uncovered, for at least 1-1/2 hours. Add the chopped Italian parsley about 15 minutes towards the end of cooking. Taste and season to your taste after this time period. Remove the bay leaf !!!! Cook noodles in boiling salted water for 5 – 7 minutes…..don’t overcook because they continue to cook during baking. First put some sauce on the bottom of the dish to prevent the noodles from sticking….you can also use olive oil for this. Layer the noodles down side by side. Spread some ricotta/sour cream/egg mixture on the pasta. Sprinkle Mozzarella cheese on next. Layer some sauce on next. Sprinkle some Parmigiana – Regiano / Pecorino cheeses (mixed well) on next. Start over again with the next layer, starting with the lasagna noodles first. with the last layer being the Bolognese sauce. Bake in preheated oven at 325 degrees for about 40 minutes. For the last 5 minutes, sprinkle a final layer of grated Parmigiano – Regiano / Pecorino cheeses on top and bake until golden. If towards the end, you believe that the cheese may burn, cover it with aluminum foil to prevent burning. 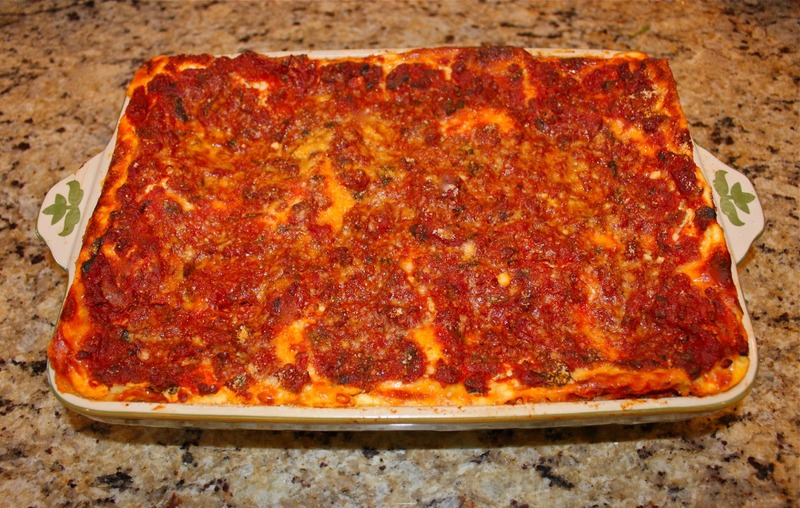 Baked Spaghetti Pie ~~ Perfect Way to Use Cooked Spaghetti! The Carnevale Lasagna is Delicioso! I make a lasagna very similar to yours. Sounds divine! And what a sweet woman you are to make this on such a hot day. The reason was so worthy, though. Oh…this sounds absolutely yummy! I’m going to have to try this recipe! Lasagna most certainly is perfect comfort food. And now that I think about it, I probably on make it once a year. I have to try your recipe with sour cream next time. I love lasagna but Bev is lukewarm on baked pasta dishes so we only do it about once a year as well. Yours sounds delicious and I appreciate getting the old family recipe. I understand about the Bolognese Sauce as I spent most of the day making an Ann Burrell recipe. Thank you everyone, this is a wonderful recipe; the only one that I prepare. My family devours it and I hope that someday you are able to try it (especially when the temperatures are cooler!). Thank you! Thank you for sharing this recipe!! I can’t wait to try it!!! Oh I hope that you enjoy this work of love from your kitchen! Yes, do mix the ricotta, sour cream and egg. The egg cooks with the two creamy cheeses to make the cheese less runny. But as I said, this is always better the second day as it firms up. It makes a huge batch, so if you have a small number of people you’re planning to serve, you can cut the remainder and wrap it up into individual servings to put in the freezer to pop out later! Please let me low if you do decide to make this lasagna and tell me what you think!